Villagers whose local shop was destroyed by ram raiders have pulled together to find the store a new home in time for Christmas. The East of England Co-op in Dedham, Essex, was targeted in an early morning raid on 10 December. 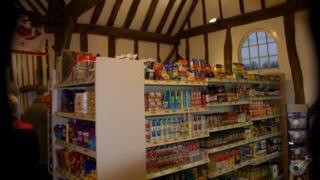 The parish council and the Co-op worked to find an alternative site, moving the shop into a barn. "It's marvellous to see the community spirit," said the council's chair. "Dedham is a very vibrant village, and sometimes you get an event like this that really does bring everyone together," said Sheila Beeton, chair of Dedham Parish Council. The duchy barn - where the Co-op has found a temporary home - is normally used by local clubs and societies, which have moved their events elsewhere. "Everyone came together to find ways and means of moving things around," Mrs Beeton said. Roger Grosvenor, joint chief executive of the East Of England Co-op, said the shop had been "in a state of near collapse" following the raid. "The difficulty we faced is there was no way of serving the community," he said. "These things come and test you but it's how you react." The firm sent its mobile shop to the village while an alternative location was found, and has since applied for an events licence to allow the sale of alcohol in the barn. "In the intervening period we've gone for a full licence for the duchy barn, because I think it's going to be at least three months before the shop on the high street is back up and running," said Mr Grosvenor. The Dedham shop is one of a series of Co-ops to be targeted by ram raiders in recent weeks. The latest is in Lavenham, Suffolk, where thieves used a vehicle to drive in and steal a cash machine at 01:15 GMT. The East of England Co-op is now offering a £40,000 reward to find those responsible for the ram raids.